Why develop a carbon estimation standard? The need for a standard is so great that it has been said by market participants that without a standard, there will be no effective long-term carbon market in Australia. The development of a standard and the resulting quality assurance is the next step in the evolution of a robust carbon industry and will ensure future integrity. "Without a standard there will be only a limited, cost constrained carbon market in which small landholders are unable to participate without aggregation services"
Land managers are finding it difficult to engage in long term contracts with buyers with assurance that the project will deliver. Assist in the negotiation of international market linkages. The Australian Government Emissions Reduction Fund is coming to a close — with only approximately $250 million remaining. As a result, there is now a transition to a more open market where liable entities will become the main buyers. These buyers are seeking to manage their future emission related risks through carbon procurement strategies that include long-term carbon abatement contracts. "The expected demand for ACCUs over the next 10-20 years is estimated to be over $5 billion"
Based on successful standards similar to the proposed Australian Carbon Estimation Standard, the ACSA has been established as an expert-based not-for-profit non-government-organisation. This is similar to the Australasian Code for Reporting of Exploration Results, Mineral Resources and Ore Reserves (‘the JORC Code’) or the Gold Standard Foundation). The ACSA has been formed as the initial vehicle to manage the implementation and ongoing administration of the standard. Stage 1 of the implementation pathway will test the proposed structural model. In tandem with the review of the structure, ACSA will engage technical leads and begin formulating the approach to each methodology. After establishing the structure and committee, the technical leads will begin the drafting stage of the project. This will include engaging technical working groups for each method to design standards that best suits each methodology. Representatives from relevant government agencies and regulators. 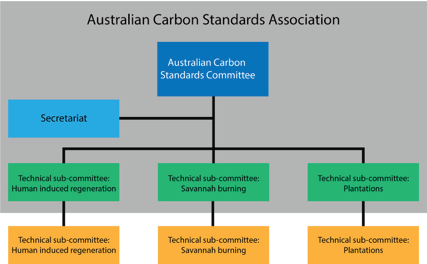 The Australian Carbon Standards Committee will have ultimate oversight of the development of the standard. Stage 3 will see the standard implemented. This will require the establishment of administration arrangements for the association put the standard in place, certification process for assessing against the standard, and raising awareness of the standard and engaging with relevant parts of the industry.